Creating a Facebook event page is a great way to promote events happening within your business. Make sure to have pertinent and accurate information on your page. 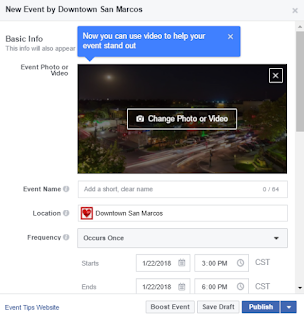 Check out this link on how to create an event page on Facebook. Generate more attention and promotion by having your event in local newspapers. Send press releases with a photo and a quote to San Marcos Daily Record, Community Impact and University Star. 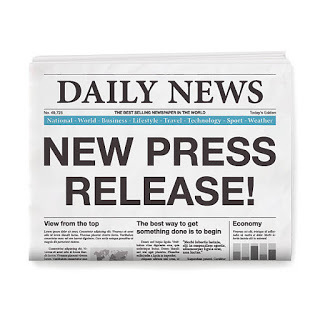 If you don’t know how to create a press release, check out this link to get you started! Check-in to your event on Facebook when making posts in order to make your event easily searchable and generate buzz amongst your followers. This link will give you a step-by-step guide on how to check-in when making posts. Facebook promotion is a great, inexpensive way to advertise your event to your target audiences. Check out this Facebook article on how to boost your event page. Having an Event, and Don’t Know It? Carpe Diem. Seize the moment when you are having huge sales, live music, anniversaries, themed drink specials or new menus. Taking full advantage of these opportunities and treating them as big events will lead to your customers rewarding you with increased sales, sense of community, foot traffic and brand loyalty. Expand your clientele and acquire more, diverse customers by participating in downtown events such as Third Thursdays, Wine Walks, Downtown Trick or Treat, and more! There are a ton of events that any business in Downtown can participate in, find what works for you and get involved.